If you thought in this Twitch broadcast that my tone was a bit strident when telling my YouTube audience to stop watching right now if they were going to leave “unproductive comments”, this was the backstory – a comment on my soya milk live video that showed up right before I went On Air. And yes, my latest M.O. is to troll the trolls with Bible verses. Everybody wins. Rinse rice, then add water, salt and pandan leaves. Cook on high heat, covered. Once it comes to a boil, reduce heat to a minimum and continue cooking until water is absorbed. Open lid and add coconut milk, cover and cook a further 15 minutes on lowest heat setting. Stir coconut milk through rice, remove from heat and keep lid covered another 10 minutes. 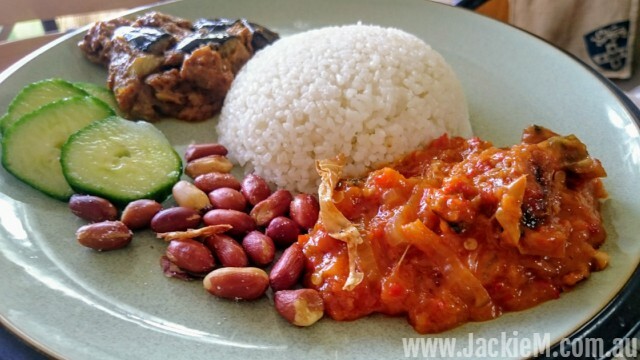 Serve with nasi lemak condiments including cucumber slices, fried peanuts (skin on), sambal ikan bilis and curry. Combine flours and seasoning with water. Mix to a paste. Spread out beancurd skin and smear with paste. Place strips of seaweed lengthwise on it, then spread some paste on the seaweed layer. Roll beancurd skin into a thin, long roll. Repeat. Steam for 15 minutes, then remove from heat and allow to cool. Heat oil and deep-fry until crispy. Remove and drain. Blend ½ brown onion, garlic and chillies in food processor. Transfer into heavy-based wok or pan and saute until some of the liquid has evaporated. Add oil and fry until aromatic and light brown in colour. Add all other ingredients and simmer. Adjust seasoning, then mix in vegan ikan bilis. Fry eggplant until browned (I deep-fry but that’s not necessary). Remove from oil and transfer into colander. Blend onion, garlic and lemongrass in food processor. Transfer into heavy-based wok, add rendang curry powder and mix to a paste. Add oil and fry until aromatic and browned. Add other ingredients and bring to a low simmer. Add eggplant, adjust seasoning, then remove from heat and serve.